This really is an outstanding and splendid book that deserves to be very widely read. DESCRIPTION: The Battle of Britain has inspired a long list of books. Some of the most important were written by the pilots who took part. The book that George Barclay wrote was discovered by his family three years after his death and was first published in 1976. Humphrey Wynn has edited the material to produce a fully revised and re illustrated new edition. In the process nothing has been lost from the original and much has been added. The original material was written in diary style and the author collected together photographs and ephemera from which the re illustration has been drawn. Many of the images have never previously been seen. The author comes through as a very likeable young man thrust into battle like so many of his comrades with what might have been a long life ahead cut short. When a personal account comes back into print it adds so much to the history of the greatest aerial battle. It was followed by many important campaigns, of which the RAF bombing campaign was to endure against great losses, but the Battle of Britain was one of a handful of key turning points in a global conflict. It was the point where the German parade across Europe was halted and the probability of German victory destroyed. 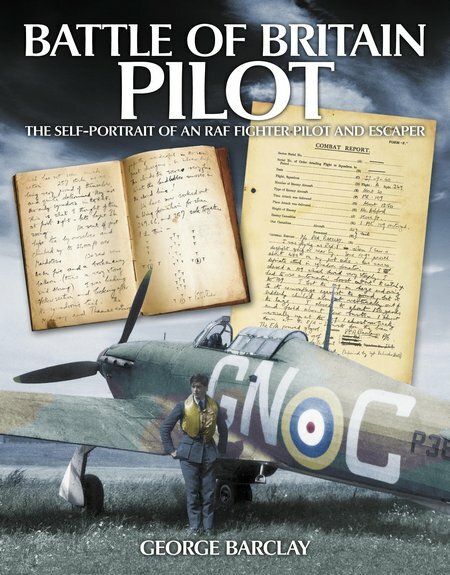 As with all good autobiographies this book begins with the making of a fighter pilot in recording some of the influences that were to produce a brave and resourceful young man. As a member of the RAF VR, Sgt George Barclay was mobilized on 1st September 1939. George passed out from RAF Cranwell in April 1940 in time to joint a front line squadron for the Battle of Britain. His progress from a Norfolk Vicarage to battle is followed with illustrations including letters, telegrams and photographs. After the Battle of Britain the RAF took the war to the Germans, flying interdiction patrols across France and Belgium with the intention of bringing the German fighters to battle. Shot down over France, George was passed down the escape line into Spain and Portugal to be flown back to Britain. The text reads well and provides much about the character of the author. It is in parts moving, inspiring, touching, sad, but throughout something of the humour and good character of the author show through. The author was then posted to El Alamein and to the combat that cost him his life. If only the text had been published, this would have made an absorbing and inspiring book, a fitting tribute to a brave young man who rose from Sergeant to Squadron Leader in hard fought conflict. The inclusion of copies of letters and a fine and generous selection of photographs adds enormously to the impact of the book. By the end of the book the reader will feel that this is an individual that he or she might like to have met. There is also an appreciation for the high quality of the writing and the vivid and compelling style. This is a very human story that will naturally appeal to all aviation enthusiasts and military history addicts, but it is as much the story of how a young pilot coped with the stress of battle and still maintained an enthusiasm for life with a zest and enjoyment of his experiences. This really is an outstanding and splendid book that deserves to be very widely read.